Traditionally, when you think of the Mother-in-law certain connotations spring to mind such as 'hard to deal with', 'uncompromising', 'implacable by nature', 'prickly', 'taken in relatively small amounts' and some may even say 'surly'. Recently I opened my bottle of The Glenlivet Nadurra Cask Strength and have aptly named it The Mother-in-law. I purchased this bottle a year ago and it has been sitting in the back of my shelf ever since. At the same time I had bought this bottle The Grey Bush (yes the Father-in-law) had opened his bottle of Nadurra and that had really made me apprehensive opening this one. Do I really want The Mother-in-law in my cupboard? I think not. OK, so jokes aside about The Mother-in-law vs The Mother-in-law, the Nadurra Cask Strength really is not something to be messed with. Intense in nature and uncompromising in aggression on the senses. I have had some heavy cask strengths in my time and this one rates as one of the more memorable. On opening the bottle things do not seem all that unrecognisable to The Glenlivet 12yo. A lot of sweetness, floral citrus with a hint of dried fruits to add. Once in the glass though everything changes quite quickly. Don't nose this one to heavily at all as the alcohol is really reacting with the air at this stage. Extremely heavy dried fruit notes with a sort of sugar carmel thickness about it. Very dense which makes it hard to distinguish any one flavour. The taste is extreme to say the least. This sucker really pushes to the back of the throat with the same citrus, sugar caramel and spicy dried fruits that are now more pronounced as saltanas (I think). Almost instantly though you start to get a dryness as the moisture is drawn from the pours in your tongue (soul sucking comes to mind). Lot's of sweetness but confusing and suspicious at the same time. The finish is massive and you can really feel this heating up the chest and stomach then curling back up into the top of the throat. 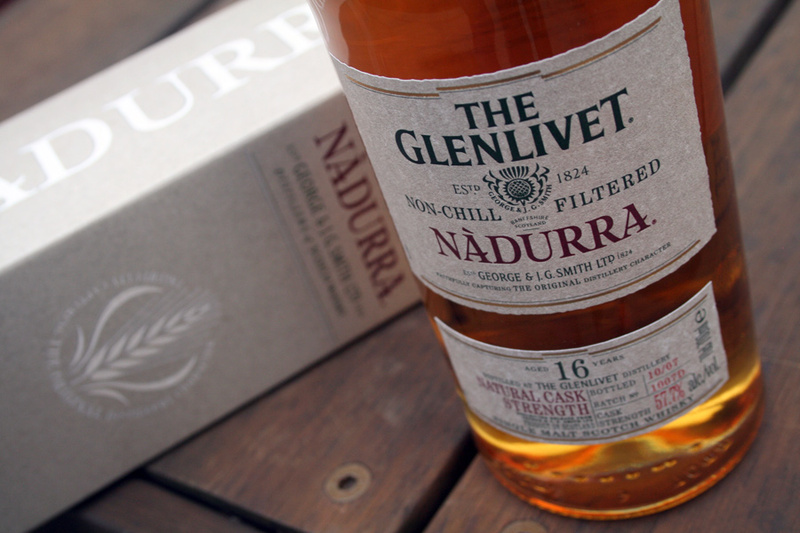 A feeling as if the whisky's probing fingers are penetrating into your very essence. Well after you have finished a short sip you are still feeling the effects minutes later. On the dram-o-meter I would rate is a 6 out of 7. Take this one in small doses and be decidedly suspicious of your own decision to pour another dram, is this really what you want right now. I actually really like it but I cannot drink much of it at any one time. The tasting notes for this one describe notes of ginger and hazelnuts. Not sure where those were but they were lost on me. The Nadurra, from what I have read, is never really the same as the previous batch. Things are always changing as releases come on the market. Knowing this does make me want to try it again in the future...though I probably would not buy a whole bottle unless it is discounted. Priced at just over A$100, upwards of A$120 a bottle is a little too hefty a tag really for what it is. Your not going to be drinking this one all that often and probably are not going to impress it on your friends or family if you can help it. Don't expect to be drinking The Glenlivet 12yo, 15yo, or 18yo and finding any direct relationship if you have a bottle of this. It stands out on it's own as something all together different from the rest of the family. And lastly the bottle The Grey Bush had was very very different to this one. His Nadurra was like putting a dry sponge on the tongue as the dryness was intense indeed. I cannot say if it was a different batch as no record was kept on that one even though it was purchased around the same time. Very very different though.